If you ever need to prototype an application that your are creating for the PC/Mac, the web or mobile devices, there is a free tool available from Infragistics. Indigo Studio lets you quickly create functional, animated UI prototypes. Like most households with teenagers I seem to spend half my life going round the house turning off lights and various consumer devices when my kids have abandoned a room... So I decided to get an electricity monitor so that at any moment in time I can see the stress on our electricity monitor without the bother of actually watching the meter dial spin it's way of it's axis! I decided to get the OWL Intuition-E monitor as you could see the current electricity usage on an iPhone & Android app, on the web and if you were so inclined they have an API available. 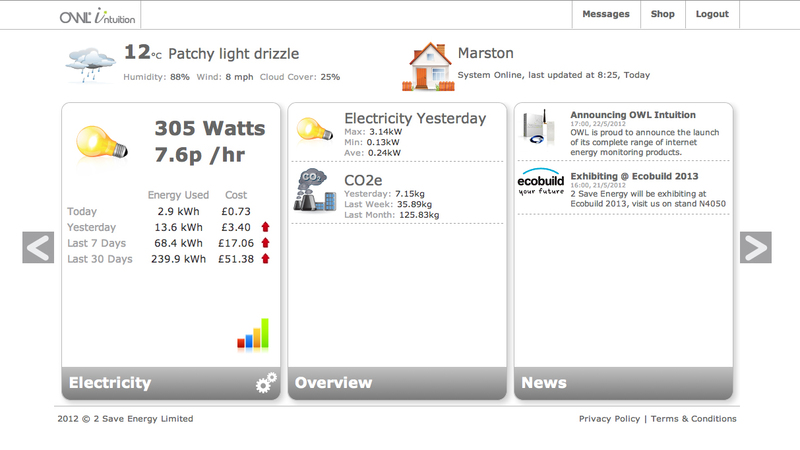 On the web site you can get an overview of your daily electricity usage with a report that looks like this sample. Also from the website you can download historical usage date in CSV format so you can analyse it in your preferred spreadsheet software. In October of 2015 I released my Electricity OWL Intuition-E Monitor program, and have done a few updates since. However I no longer use the program myself, and won't be maintaining the code so I have decided to end of life the program. I will allow it to be downloaded until the end of January 2017, but after that I will remove it from the site. There have been a steady number of downloads, and I may consider releasing the code on GitHub if anybody thinks it's of interest. Instead of using that program I now run Domoticz with a RFXTRX unit and that records the daily electricity usage, and can trigger events if needed. Hopefully I'll find a moment soon to write up some thoughts on that system. Run a website and ever wanted to create your own favicon but not sure how? Do you even know what a favicon is?? Microsoft have released Hyperlapse for Windows, Windows Phone and Android, which is a really cool way to make smooth time lapse videos from original videos you shoot on your mobile phone and cameras like GoPros and your drones! A hyperlapse is to all intents and purposes a video that has been sped up and smoothed out. So if you record a video whilst cycling, skating, sking, driving a car, or pretty much during any other activity and then use software to speed it up, you will get a bumpy difficult to watch video. Hyperlapse smooths out the bumps using software-based video stabilization technology from Microsoft Research. Since August of last year I have had a Ring Pro Doorbell which I bought from Amazon, (Ring are in fact owned by Amazon), - https://amzn.to/2IbmBZN. And currently this is priced at about £200, but with Amazon it always seems to pay to watch an item for a while and wait for price fluctuations. I say this because I managed to get this for about £60 cheaper - it always pays to be a little price savvy. There are also other models available, but the Pro was the only one that would fit where I wanted it. It was easy to install, and if you do need assistance there are loads of helpful guides on YouTube that will help you with the process. Obviously the main selling point is house security and being able to remotely answer the door, but I do like a gadget that has an API available. So currently I'm working on a Windows application that will automatically download the video files from the Ring website. There is a small fee payable to view your videos in the cloud, but depending on the subscription you have paid, Ring will only keep that video for about 30 days, and then it disappears. Prior to the point you can download this on your mobile device, but it's a completely manual process for each video. Personally I'd like to have the videos in perpetuity, or at least until I decide that it is no longer needed, so using my C# capabilities and Koen Zomers Ring API which I found on GitHub at https://github.com/KoenZomers/RingApi, I will be creating an appropriate tool. I did spot a small issue in the API last year, but Koen was very responsive and has fixed the issue. I've fleshed out a basic program that I'm currently testing out and will probably publish it for others to use at some stage, but what features would you like to see? Please get in contact and let me know what you think, and who knows I may incorporate your ideas. As someone who works on computers on a daily basis, (PCs mainly, but I do have access to a Mac as well), I just thought I would share with you some of the tools that I use on a regular basis. In the course of work, I keep meeting people who have recently had computers replaced with new Windows 8 machines, and generally speaking most people seem to hate it! This is basically a fear of something that is different, and also due to the fact that most people didn't use a lot of features that were already available in Windows 7. For instance I was always one for using the Windows 7 feature whereby you pressed the Windows key and then start typing the program name I want to start, and then when the name appears, press the enter key to start it. This is rather than searching for it through all the menus. Most people didn't use this feature previously! This works the same in Windows 8, but you get thrown back into the metro/modern interface whilst you type. This in itself can be quite unnerving for some, but keep on typing and the effect is the same. Ever had a problem deleting, moving, or renaming a file only to get a message box with an error saying something like "The file is in use by another program or user" or that access is denied or a sharing violation has occurred? To work out what program or process has already claimed ownership of the file you can use Microsoft's Process Explorer program. Process Explorer was written by Mark Russinovich in his Winternals days, but then subsumed in to Microsoft when that company was taken over. The program is regularly updated and available from technet.microsoft.com/en-gb/sysinternals/bb896653.aspx.